We'll help you find the perfect boat. We look at the WHOLE PICTURE, with our years of experience. Half of our clients are people who come to us for help in the boat buying process. It is free! No cost to you. We can help you find the right boat to let you live your dream. We'll get you into, and out of the boat. We'll help you make the best decisions for your cruising needs. From the right design and sailing characteristics to the quality and condition that will affect your exit strategy. We go anywhere and everywhere. We attend to every aspect of the boat buying process. Our goal is to truly define your requirements so you can fulfill your dreams. While we specialize in liveaboards and blue water boats, we also know that not everyone will cross an ocean. But if you do, you'll be glad you came to RogueWave. First, we analyze your requirements. Your dream may consist of setting sail over the horizon and sailing on through the seven seas. A beautiful boat is something to love even if it is tied to the dock! Or maybe you'll do coastal cruising or bay sailing or take her around the buoys. Maybe you'll plan to live aboard comfortably full-time. With amazing kids! We will help you find the perfect vessel to match your requirements. Whether you are spending one million or fifty thousand dollars, the level of service will be the same high quality service that you expect and deserve. Once we know what you want to do, we can pretty much tell you which boats can work for you. Through our knowledge and experience, we know which boats have the right hull shape and keel and rudder design. We can guide you in the rig design and equipment. We know which boats are built to last. 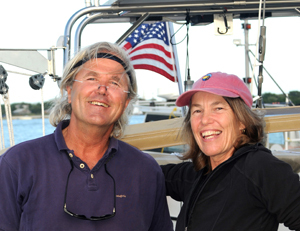 We know the resale aspects of boat ownership. We'll help you focus on yachts with the interior layout you need to live aboard and sail. We know the systems that will keep you safe and comfortable. Each designer offers unique characteristics. Whether it's Bob Perry, Chuck Paine, Bill Crealock, Bill Tripp, Ted Hood, Ted Brewer, Al Mason, Lyle Hess or a dozen others we understand the form, the fit and function, of every design element, plus your budget and we can match you with your perfect yacht. We promise that we will listen to your requirements with an open mind and then advise you as honestly as we can, what will be the best vessel for your specific needs. We will not sell you what's in our inventory if it does not match your particular needs, or what vessel which you might think is right, but we will present to you which sailing vessel will fulfill your requirements the best, backed by facts and supported by technical expertise. Our friend didn't know they wanted a Norseman 447! Perfect. Our promise is to continue providing service and support for the entire ownership process. Throughout the purchase and sales process, we support you every step of the way. We are members of the Yacht Brokerage Association of America and adhere to the best industry practices. We use all the standardized agreements. We handle everything for you including evidence of clear title and the transfer of title or US Coast Guard documentation. And we don’ t just sell a boat and wave goodbye. There is no one else in this business today that can provide you with the service level you deserve. This consists of technical support, planning of and overseeing installation of systems, helping find repair services in foreign ports, navigating passages, providing weather forecasts, finding crew, obtaining dockage, and even delivering your vessel to your dock or home port. We often support proud new owners aboard the maiden voyage to teach them the systems and show them the ropes. We where even line handlers for our friends going through the Panama Canal! Fun. Our promise is to provide you continuous service and support. Wherever your sailing adventures take you, we are a phone call away! 410 571 2955 ! So we invite you to join the party. We would love to represent you. We will be YOUR Buyer's Agent at no cost to you. We will help you find the right boat no matter where she is. We will help with everything before, during, and after your purchase. We do NOT just sell the boat to you and wave good bye. If fact, you are stuck with us. This is a rendezvous of Valiants in 2008 Boat Show Annapolis in Luce Creek. The relationship we build with you is for the long haul. We'll get you into this and we will help you to get out of sailing when that time comes!